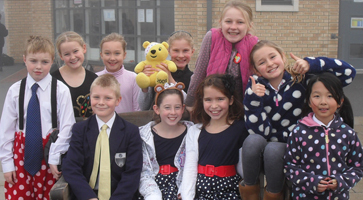 Junior School pupils had spots before their eyes…all in a good cause! The youngsters each paid £1 to wear something spotty to school in aid of Children in Need. They could also wear Pudsey or Blush ears or a bandana and Pudsey Bear cookies were on sale at school for 50p. In the run-up to the day, the children were invited to pay 50p to enter an art competition to celebrate Pudsey’s new found friend, Blush by drawing, painting or making a picture of either of the two characters. Prizes for the most creative, effective entries went to Elie Glaser and Vikram Sharma. Pictured in their spotty outfits are: back row (L-R) Harry Richmond, Issie Sutton, Emma Johnson, Abbie MacLeod and Beth Jordan. Front row (lL-R) Jacob Butterfield, Laura Memmott, Eve Woodward, Hannah Marriott and Ruth Tay.